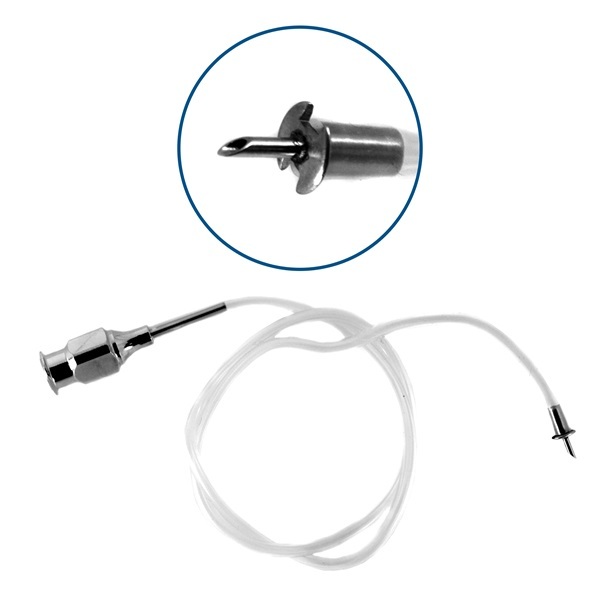 Infusion cannulas ranging from 20 gauge to 23 gauge, comes with tubing and luer-adapter. 20 gauge, 6mm beveled tip luer-adapter, comes with 26cm tubing. 20 gauge, 4mm beveled tip luer-adapter, comes with 26cm tubing. 22 gauge, angled luer-adapter, 7mm from bend to tip, self-retaining beveled tip, comes with silicone tubing and luer-adapter. 23 gauge, 5mm beveled tip luer-adapter, comes with 26cm tubing. 23 gauge, 6mm beveled tip luer-adapter, comes with 26cm tubing.